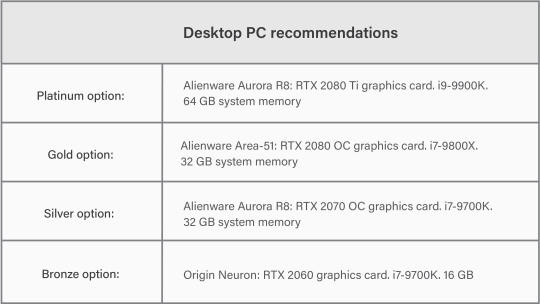 In this guide, you can compare your desktop PC or laptop hardware with Lumion’s system requirements, and discover how you can significantly improve your experience. Lumion is a powerful 3D rendering program that creates detail-rich and realistic visuals of your designs, but in order to get the best performance out of Lumion, you are going to need a fast desktop PC or laptop with a powerful graphics card. A fast Lumion experience depends heavily on the graphics card (GPU). You will also need a fast processor (CPU) and a lot of computer memory (RAM) and graphics card memory. With the aim of providing relevant information for your specific issue or question, we’ve also provided several links at the end of this guide, including a breakdown of the graphics cards and CPUs you may need, what to do if you get a low score in the Lumion benchmark, and how to choose a power supply. We invite users with hardware issues to check out the Knowledge Base or reach out to us on the Lumion Support Center as performance depends on numerous factors outside Lumion’s control, and we cannot guarantee that a certain hardware setup will always provide expected performance. The most accurate method for checking the Lumion performance requirements of your hardware is to use the in-program benchmark. With the benchmark, you can check the four main components that have the most impact on Lumion performance. These include the graphics card (GPU), the processor (CPU), system memory (RAM) and graphics card memory. Lumion’s benchmark tool takes a snapshot of your GPU and CPU speed and shows your computer’s maximum system memory (RAM) and graphics card memory. Not a Lumion user yet? You can test your computer (and test Lumion 9.3) by downloading the free, 14-day trial. 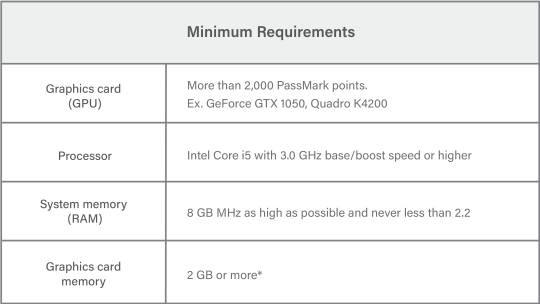 Once you know the hardware in your computer, the next step is to see how it compares to Lumion’s minimum or recommended system requirements. 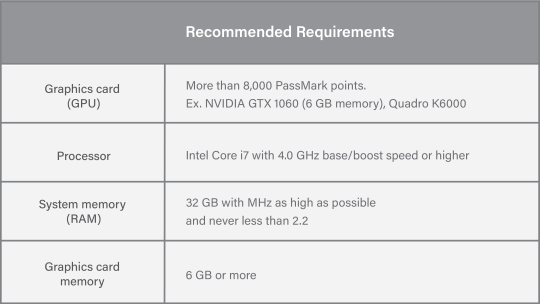 If your hardware meets or exceeds these requirements, you should have a smooth experience when working on large scenes in Lumion’s Build Mode. In the Build Mode, you can check the size of the scene and the frame rate of your computer in the upper-right-hand area of your screen. For instance, when moving around the Beach House example scene with a GTX 980 TI graphics card, the frame rate hovered around 18 frames per second (please note that your experience may differ). With the recommended system requirements, moving around in the scene is fast, smooth and enjoyable. Additionally, faster hardware allows for a faster rendering time in Lumion. With the recommended system requirements and a GTX 980 TI graphics card, rendering the Beach House scene as a desktop sized image (1920 x 1080) took 19 seconds (please note that your experience may differ). Computer specifications for this render: 1) GTX 980 TI graphics card, 2) i7-6700K processor @ 4.00 GHz, 3) 32 GB RAM and 4) 6 GB of graphics card memory. You can run Lumion with the minimum system requirements, and anything you do to increase hardware performance toward the recommended requirements will improve your Lumion experience. If your setup meets only the minimum, you may see some performance issues. This is especially true when working on large and detailed scenes, such as massive urban or rural scenes, 4K videos, and large surfaces featuring the customizable 3D grass or furry materials. With the same Beach House example scene as earlier, the average frame rate with the minimum system requirements and a GTX 880M graphics card was significantly lower, hovering around 13 frames per second (please note that your experience may differ). Without a fast enough desktop PC or laptop, you may experience slower render speeds and a laggy frame rate in the Build Mode editor. Configuring a powerful workstation to run Lumion at a reasonable price can be a daunting task. That’s why we have a few recommendations for Lumion-capable desktop PCs and laptop computers. We’ve tried to consider value for money in these examples but we haven’t taken into consideration other criteria, such as computer certifications by other software suppliers or any considerations that your IT department might have. More importantly, we don’t have any sponsorships from hardware manufacturers and we are not advocating one particular desktop PC or laptop over another. In addition to these examples, you can search for computers with similar specs. 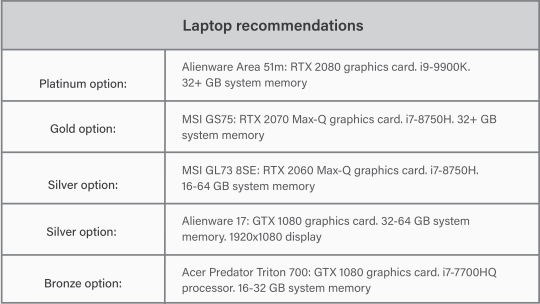 This guide to laptop recommendations can also help showcase what a Lumion-capable system may look like. Hardware can be a complicated problem that’s not so fun to deal with. Nevertheless, there are a lot of resources available to help you get a flawless experience when running Lumion. 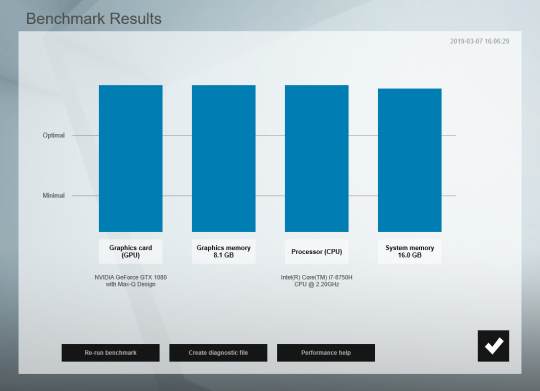 Why is your CPU (processor) score low in the Lumion Benchmark test? Why is your Graphics Card Score low in the Lumion Benchmark test? Don’t see your question here? Check out our system requirements section of the Knowledge Base or reach out to our expert Support Team on the Lumion Support Center.